In a group sequential trial, the rejection boundary is derived under the null hypothesis and is used to stop the trial early to reject . Similarly, the acceptance boundary is derived under the alternative hypothesis and is used to stop the trial early to accept . But, for a trial with early stopping either to reject or to accept the null hypothesis, dependency exists between these two boundaries. This section describes the effects of the acceptance boundary on the derivation of the rejection boundary in a group sequential trial. The ALTREF=10 option specifies the alternative reference 10. The METHOD=ERRFUNCPOW(RHO=2) option uses a power family error spending method to generate the rejection boundary. The ALPHA=0.025 and BETA=0.10 options specify the Type I error level 0.025 and Type II error level 0.10, respectively. The power parameter used in the design lies between and , where the boundaries created with the power family error spending method are similar to the boundaries created from the Pocock method, and the boundaries created with are similar to the boundaries created from the O’Brien-Fleming method. The "Boundary Information" table in Figure 101.12 shows the rejection and acceptance boundary values at the stages. With an error spending function method, the boundary values are derived sequentially. 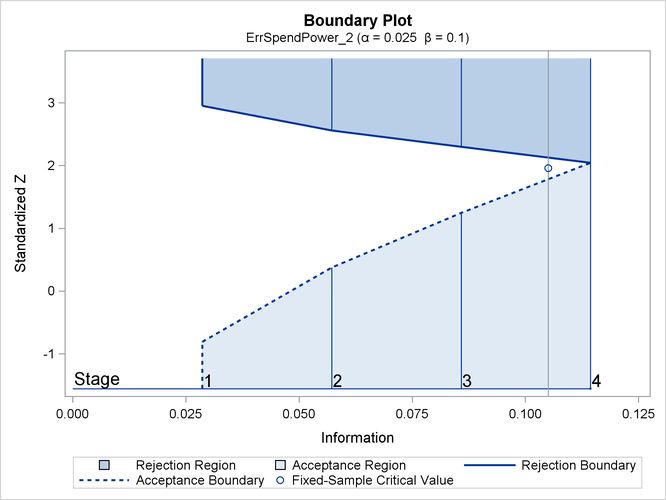 In particular, the rejection boundary value at a stage is derived conditionally on both rejection and acceptance boundary values at the previous stage. See the section Error Spending Methods for a detailed description of the error spending methods. With ODS Graphics enabled, the "Boundary Plot" is displayed by default, as shown in Figure 101.13. The continuation region is affected by the acceptance boundary, and the rejection boundary is thus adjusted for this acceptance boundary to maintain the Type I error level. For a design with early stopping either to accept or to reject , the shapes of boundaries affect the critical value at the final stage. For the acceptance boundary, a liberal method at early stages, such as a power family error spending method, lowers the critical value at the final stage. For the rejection boundary, a conservative method at early stages, such as a power family error spending method, also lowers the critical value at the final stage. In addition, a larger Type II error level also lowers the critical value at the final stage. The resulting critical value at the final stage might even be less than the critical value for the corresponding fixed-sample design. The resulting "Boundary Information" table in Figure 101.14 shows that the boundary value at the final stage 1.9267 is less than 1.96, the critical value of the corresponding fixed-sample design. That is, can be rejected even if the test statistic at the final stage is less than the critical value for the corresponding fixed-sample design, which is not desirable. Therefore, for a design with an acceptance boundary, the design should be used with care. Another reason why the rejection boundary should not be affected by the acceptance boundary is that a Data and Safety Monitoring Board (DSMB) might not strictly adhere to this acceptance boundary, and thus the Type I error level might not be maintained. Therefore, it might not be desirable for the rejection boundary to be affected by the acceptance boundary (Lan and DeMets 2009, p. 103). You can use the conditional power approach for a design that stops early only to reject . For this design, the conditional power at an interim stage k can be defined as the total probability of rejecting at any future stages under a specified hypothetical reference, given the observed statistic at stage k. A small conditional power indicates a small probability of success (rejecting ) given the current data, and the trial can be stopped early to accept (Lan, Simon, and Halperin 1982; Lan and DeMets 2009, p. 101). For a detailed description of conditional power, see the section "Stochastic Curtailment" in Chapter 102: The SEQTEST Procedure. You can use a design with a nonbinding acceptance boundary (Zhu, Ni, and Yao 2011, pp. 132–133). For this design, the rejection boundary is created by ignoring the acceptance boundary. Thus, the Type I error level is maintained even when a trial is allowed to continue for a test statistic that falls in the acceptance region, and the rejection boundary values (with the standardized Z statistic scale) are identical to the boundary values that are derived in the corresponding design that stops early only to reject .